The idea for this project came from this pin. I attempted making a gallery wall myself by buying a variety of different frames that were all the same color, but I could never get the arrangement to look right. I was very happy to discover there is something for people like me at Michael's. They should name it "Gallery Walls for Dummies" but it's actually called Gallery Solutions. I bought nine frames of the same style when they were on sale. Even better, there is a paper template you can buy for just a few dollars. It has different arrangements on it so you can do a smaller arrangement or a diagonal arrangement for a stairway. You just tape the paper template to the wall, hammer in the nails in the designated spot on the template, remove the paper from the wall, then hang your pictures. Easy! I am terrible at hanging pictures so this was well worth the few bucks. The next step was to plan out which pictures to use. I went through all of our pictures from our travels and family vacations and chose my favorites. I uploaded the digital photos to Snapfish and had each picture printed in the size that was needed for each frame. For an arrangement like this, it's really important to get the spacing just right and all the pictures need to be straight. The paper template really helped with that and saved a lot of time. It turned out really well and it's great way to fill up a large wall. 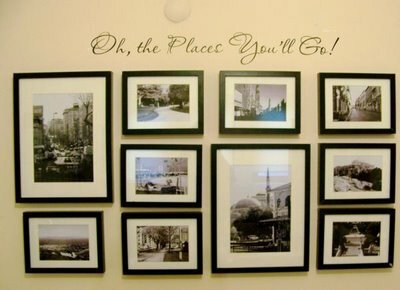 I love having a reminder of all the places our family has been! That is FABULOUS! 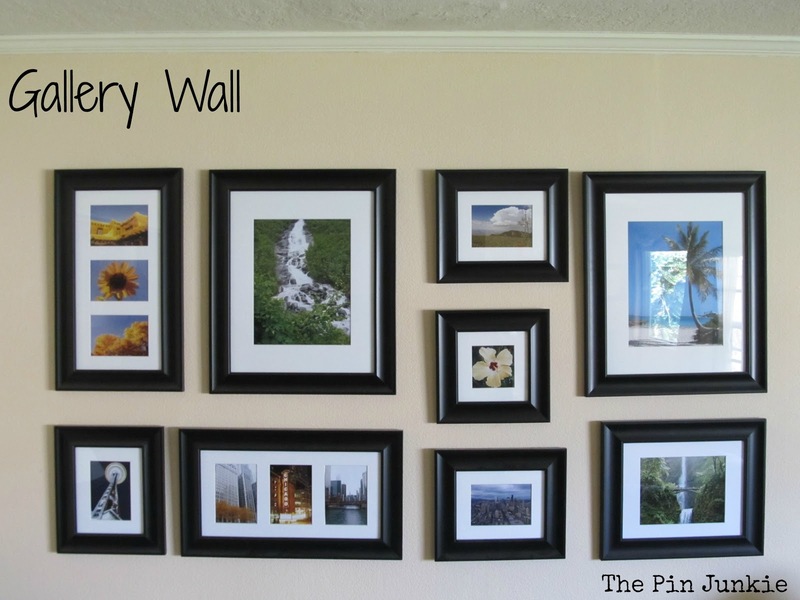 One of the things on my Day Zero Project list is to create a gallery wall in our living room. Thanks so much for sharing this smart and easy way to do it!